Most investors will have heard the expression of the “canary in the coalmine”. Coal miners used canaries as an early warning sign that toxic gases were filling the mine, with a dead canary meaning miners should run for their lives. Over the last year the canary for high yield debt has gone silent, setting off the alarm for investors. It’s too early to say whether the canary is dead or just having a nap, but fundamentals and prices are clearly signifying a tougher environment for sub-investment grade debt. On the fundamental side, both bonds and leveraged loans have seen easier terms and increasing supply since 2010. It’s difficult not to make the comparison with US subprime from 2004-2007, which also saw volumes spike and loan terms easing before a collapse. 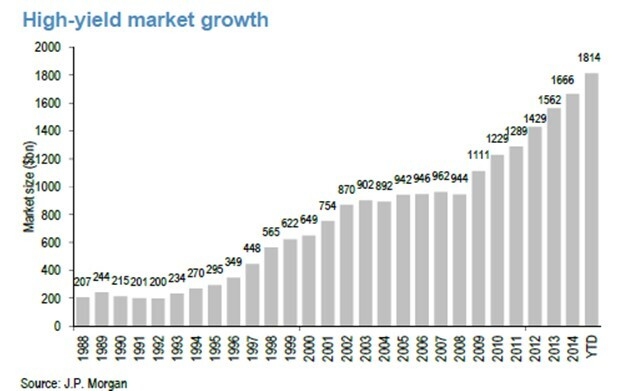 The graph below shows that outstanding US high yield bonds are now double the amount of 2008. In the light of a low interest rate environment it’s no surprise that business owners are choosing to issue more debt or that investors have shifted to higher risk bonds chasing higher yields. For leveraged loans the growth has also been substantial over the last decade, from US$191 billion in 2005, to US$529 billion in 2009 and US$851 billion at last count. 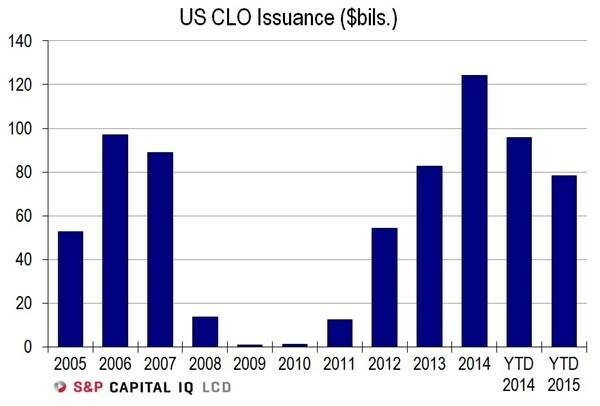 CLOs have been a very helpful part of funding this growth, with their issuance spiking above pre-crisis peaks. The quality of issuance has weakened, with a mixed picture when comparing to the unsavoury 2007 vintage. The graph below shows that the B rated and lower proportion was as bad as 2007, but the CCC rated component (companies whose probability of default over a five-year period is expected to be almost 50%) is only about half of the 2007 level. 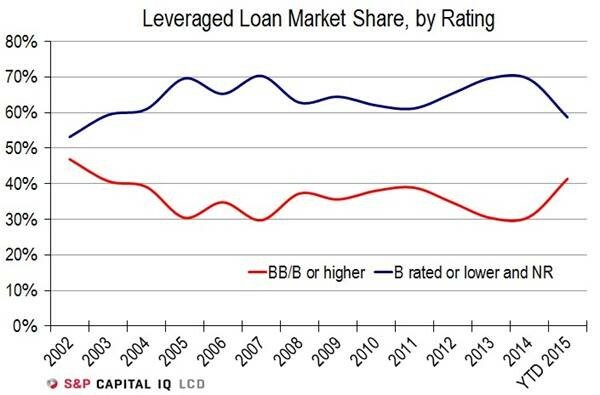 Recent work from Edward Altman (most well-known for the Altman Z score) has median leverage and gearing ratios for high yield borrowers worse than in 2007. However, the median interest cover ratio is better as a result of lower reserve bank rates. 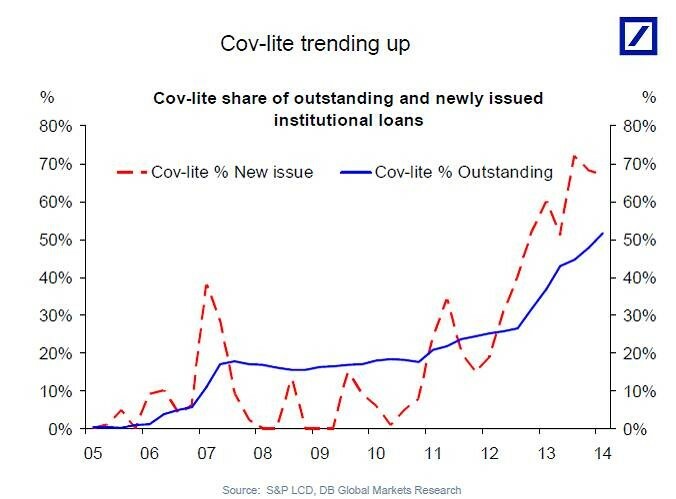 Lastly, cov-lite loans are now a mainstay of the leveraged loan markets as shown below. This means that future recovery rates for senior secured loans are likely to be noticeably lower than they have historically been as the lack of covenants delays companies taking action if their indebtedness is increasing. As a result of the massive increase in issuance, below average default rates and the predominance of B and CCC rated issuance, US high yield debt is overdue for a surge in the number and dollar value of defaults. Mapping the historical probabilities of default against the ratings of the debt outstanding leads to an estimate of 20% of all high yield debt defaulting in the next five years. This equates to US$527 billion of defaults on the US$2.65 trillion of debt outstanding. For diligent credit investors, none of the above is new information. What has been changing recently is the pricing of secondary trades and the ability to get away new deals. Spreads on both high yield bonds and leveraged loans have widened substantially in the last year. The sell-off so far has been entirely rational, with the better quality BB rated companies still able to issue high yield debt with the average margin over treasuries increasing from 3.32% to 4.08% this year. For companies rated CCC or below new issuance has largely stalled and the average margin has gone from 9.69% to 13.72%. In leveraged loans the average bid price on the S&P/LSTA leveraged loan 100 index has fallen from 95.34 to 89.21. The table below show the distress ratios for both bonds and loans. 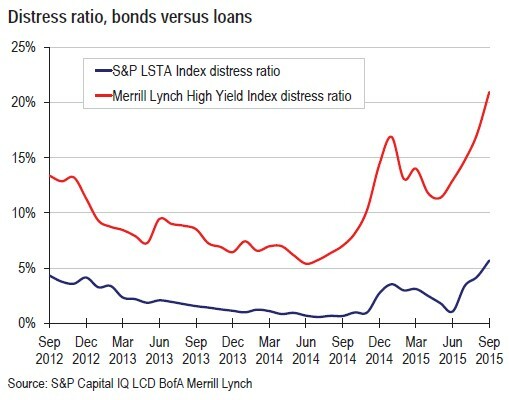 Companies are considered distressed when the margin on their debt is above 10%. These companies have typically lost the ability the issue new debt or equity and are considered to be at high risk of default in the medium term. The perception of risk has clearly changed. Banks underwriting new issuance are being hit on two fronts. Loan buyers are demanding greater discounts and stronger terms on loans issued by the weakest borrowers. The failure to syndicate US$5.5 billion of debt from Carlyle’s purchase of Veritas is the most notable of a growing list of deals stuck with banks. Regulators are conducting more frequent reviews of high risk lending and have set guidelines that limit the leverage ratio to six times EBITDA. The reduced appetite by investors for the highest risk debt could be the end of the road for many companies. Some investors don’t foresee much of an increase in defaults in the near term as the maturity wall shown below doesn’t take off until 2017. However, this view is flawed as most borrowers trigger a default event when they run out of cash and cannot pay interest or when they breach their covenants. This is the experience with energy and mining companies of late, where cash reserves are being depleted after falls in commodity prices. On one measure, oil and gas producers are using 83% of their operating cashflow for debt repayments. If current conditions stay, the reduced risk appetite of investors means that struggling borrowers are unlikely to be able to borrow more and extend their runway. If assets sales and/or equity raisings are not palatable or possible then bankruptcy is the inevitable end. It’s clear the volume surge in high yield debt since 2010 and loosening of credit standards will bring a wave of high yield debt defaults at some point in the medium term. Whilst equity markets remain bullish over-leveraged companies still have one potential pathway to recapitalise, but the days of simply borrowing more to cover cashflow shortfalls appear over. For highly indebted companies without earnings growth the end of the runway is rapidly approaching. Recent increases in margins mean that some of this is priced in, but certainly not a return to the conditions of late 2008 and early 2009. The sheer size of high yield debt markets and the potential for buyers such as CLOs, ETFs and retail funds to quickly lose their appetite a return of panicked conditions cannot be discounted. It seems that many investors are ignoring the silence of the canary and the exit door isn’t big enough for many to get out all at once. Investors will be best prepared by focussing on the return of capital rather than return on capital from high yield debt. This article has been prepared for educational purposes and is in no way meant to be a substitute for professional and tailored financial advice. It contains information derived and sourced from a broad list of third parties, and has been prepared on the basis that this third party information is accurate. This article expresses the views of the author at a point in time, and such views may change in the future with no obligation on Narrow Road Capital or the author to publicly update these views. Narrow Road Capital advises on and invests in a wide range of securities, including securities linked to the performance of various companies and financial institutions.